Use the Message opened condition to track who opens the messages you send. The condition triggers another step in the workflow based on what your contacts do with them. The element has “if yes” (green) and “if no” (red) connectors. When you attach an action to the “if yes” connector, we trigger this action only for the contacts who open your message. People who don’t open it are affected by the action you connected to the “if no” connector. You can select a specific message or any message to be the trigger. You can also specify how long you’d like the workflow to wait for the condition to be met. See When to assume the condition wasn’t met for more information on when to use Never and After some time. What types of messages can I use for the Message opened condition? You can set up the condition to be broad or very specific, depending on which message open you choose. 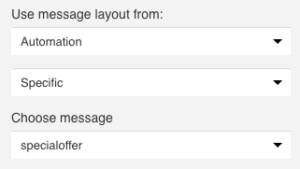 If you’d like the next step to be triggered when any of your messages is opened, set the condition properties to Any. If you’d like the next step to be triggered when a particular message type is opened, first select the message type. Then, select Any from the next drop-down. If you’d like a specific individual message to be the trigger, select the message type. Then, select Specific from the drop-down, and choose the message from the list of available messages.